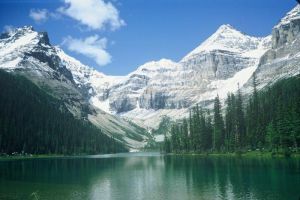 This peak is #93 on the Height List for Alberta .Tuzo was originally called 'Sagowa' by Samuel Allen (the early alpinist and nomenclaturist of the area) on his map of 1894, which is the Stoney word for ?seven?, this peak being the seventh in order from S to N of the Ten Peaks. However, the first ascent of this peak was made by Henrietta Tuzo (1880-1955), accompanied by the guide Christian Kaufmann, in 1906. Ms. Tuzo was a founding member of the Alpine Club of Canada, and the peak was re-named in memory of her early contributions to this group. Their route ascended the 3-4 couloir, crossed the Fay Glacier, to the Allen/Perren col, and traversed thence to the glacier and S ridge on Tuzo.